The archaeological site of the Asclepeion of Epidavros, and the unique Ancient Theater, make up the first choice for visitors of Argolida. It is located circa 30 km from Nafplio and 4 km from Ligourio, while since 1988, it is included in the list of world heritage sites of UNESCO. The Asclepeion of Epidavros was one of the great national sanctums of antiquity. It belonged to Epidavros, a small city-state of the classical times, that was located at the nearest western coast of Saronikos bay, where nowadays lies the community of Palea Epidavros. Along the basis of an ancient worship, the therapeutic art was developed in that place, since the 6th century BC and the sanctum was considered the cradle of medical science. In the 4thcentury BC, it was decorated with glorious buildings, such as the temple of Asclepeios and the building “Tholos”. Free entrance for students from EU countries and children under 18 years. Mycenae is one of the most important archaeological sites, globally renowned and a symbol of heroic Greece. It is located ten kilometers away from Argos, on the road to Corinth from the old national highway, built on a rocky ridge, among two high cone hills, Profitis Elias (805 m.) and Sara (660 m.), at a strategic point, that dominates many road networks. “Polichrises Mykines” (Multigold Myceane), the kingdom of mythical Agamemnon, who united under his sword all of the Greeks that pillaged Troy, and made Mycenae known throughout the world, and who was the first to be praised by Homer in his epic work, it is the most important and richest palace center of the Later Copper Period in Greece. Its name was given to one of the most glorious civilizations of Hellenic prehistory, the Mycenaean, and the myths that connect to its story were passed on through the ages by the epic of Homer and the great tragedies of the classical period, while they have inspired and continue to inspire all over the world, spiritual creativity and art. Its “cyclopean” walls, constructed out of huge limestone boulders, already in ancient times commanded admiration and bewilderment, majestically marking the location that was populated nonstop for many centuries in antiquity, and that controls a large stretch of the valley, as well as important routes to Argos, Mycenae, Nafplio and Epidavros. According to myth, the first mythical king of the city was Proitos, brother of Akrisios, king of Argos, who after a quarrel with his brother went to Lykia, and from there came back bringing Cyclopes with him, who founded these huge walls. In mythology, the king of Tirynth, Evristheas, ordered Hercules his feats. In the prehistoric times, the site met its prime mostly during the early and later Bronze Age. In the second phase of the Proto-Helladic period (2700-2200 BC) an important center must have been here, densely populated and a uniquely built circular building, 27m in diameter, at the top of the hill. During the later Bronze Age, the hill was gradually fortified and included within its “cyclopean” walls the palace compound, as well as other building, used for administrative and ritual functions, housing goods and workshops, while a limited number of buildings was used as residencies for members of the ruling class. In the inland of Epidavros lies Asclepeion, the seat of the doctor god of antiquity (Asclepius) and the most important healing center of the whole Greek and roman world. The place was devoted to deities with healing attributes, already since the prehistoric period. The worship of the protector god of human health and personal bliss, Asclepius, who was portrayed by mythical tradition as a native son of Apollon and Koronida, the granddaughter of Malos, king of Epidavros, was established around the 6th century BC and gathered a reputation that spread rapidly. The Asclepeion of Epidavros became the most renowned of all the asclepei (healing centers) in Ancient Greece, due to the many and serious cases that were treated there. Patients from all over Greece, but also from the Mediterranean basin would reach it, suppliants (“hiketes”) of the divine compassion. Here, medicine was based on human intellect and ceased to be regarded as intervention from the divine element. 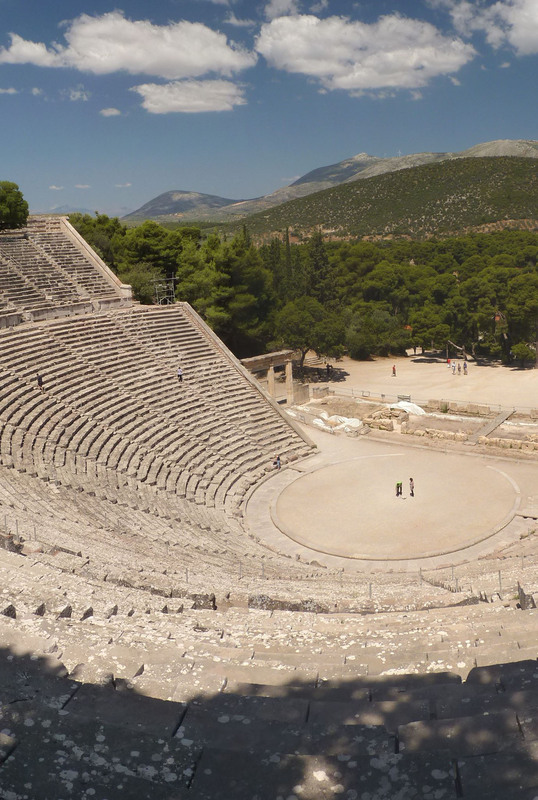 same as Ancient Theater of Epidaurus, Ticket includes both sites.